Aβ (25-35) treatment inhibited the cell survival rate in a dose-dependent manner. 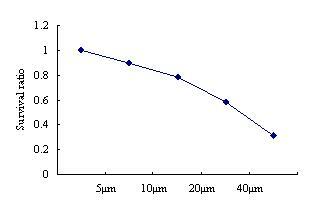 Method:MTT assay; Cell Lines:SH-SY5Y cells; Concentrations:5-40 μM; Incubation Time:24 h.
 Takashima A, Honda T, Yasutake K, et al. Activation of tau protein kinase I/glycogen synthase kinase-3 β by amyloid β peptide (25–35) enhances phosphorylation of tau in hippocampal neurons. Neuroscience research, 1998, 31(4): 317-323. Giovannelli L, Casamenti F, Scali C, et al. Differential effects of amyloid peptides β-(1–40) and β-(25–35) injections into the rat nucleus basalis. Neuroscience, 1995, 66(4): 781-792. 1. Millucci L, Ghezzi L, Bernardini G, Santucci A (2010) Conformations and biological activities of amyloid beta peptide 25–35. 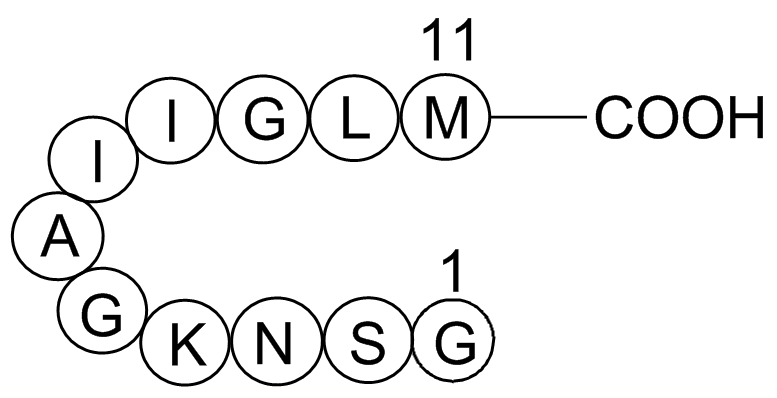 Curr Protein Pept Sc 11: 54–67. 2. Stepanichev, M.Y. ; Moiseeva, Y.V. ; Lazareva, N.A. ; Gulyaeva,N.V. 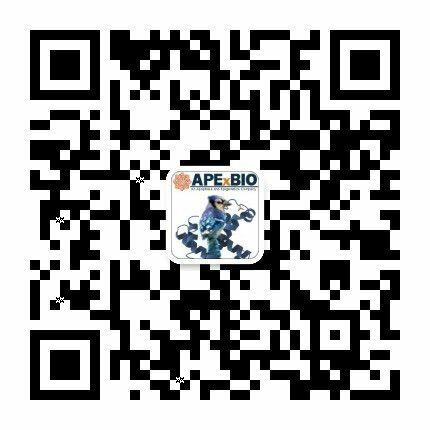 Studies of the effects of fragment (25-35) of beta-amyloid peptide on the behavior of rats in a radial maze. Neurosci. Behav. Physiol., 2005, 35(5), 511-8. 3. Limón, I.D. ; Díaz, A.; Mendieta. L.; Chamorro, G.; Espinosa, B.; Zenteno, E.; Guevara, J. Amyloid-beta(25-35) impairs memory and increases NO in the temporal cortex of rats. Neurosci. Res., 2009,63(2), 129-137. 4. 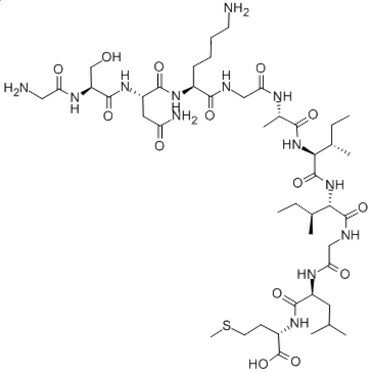 Pike, C. J.; Burdick, D.; Walencewicz, A. J.; Glabe, C. G.; Cotman, C. W. Neurodegeneration induced by beta-amyloid peptides in vitro: the role of peptide assembly state. J. Neurosci., 1993, 13, 1676-1687. 5. Stepanichev, M.Yu; Lazareva N.A. ; Onufriev, M.V. ; Mitrokhina, O.S. ; Moiseeva, Yu.V. ; Gulyaeva, N.V. Effects of doses of fragment (25-35) of beta-amyloid peptide on behavior in rats. Neurosci. Behav. Physiol., 1998, 28(5), 564-6 . 6. D'Errico, G.; Vitiello, G.; Ortona, O.; Tedeschi, A.; Ramunno, A. and D'Ursi, A.M. Interaction between Alzheimer's A(25-35) peptide and phospholipid bilayers: The role of cholesterol. Biochimica. Biophys. 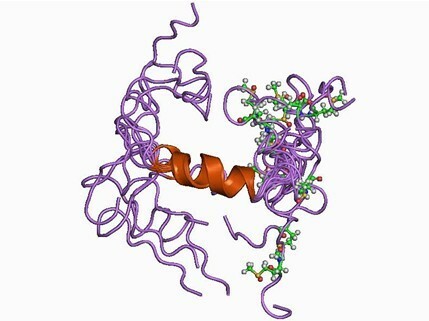 Acta (BBA) – Biomembr., 2008, 1778, 2710-2716. 7. Kaneko, I.; Yamada, N.; Usui, Y.; Oda, T. Possible involvement of β -amyloids racemized at Ser residue in Alzheimer’s disease. Alzheimer’s Disease: Biology, Diagnose and Therapeutics. John Wiley & Sons: Chichester, 1997, pp. 519-528.